On Friday night, burgergal took me out for a private dining experience at Aretsky’s Patroon. Normally there would be no reason for me to eat there. It’s a bit pricey for my wallet, and I am not making the type of dough necessary to pop into this place for a quick après-work cocktail (yet). But on Friday nights, something magical happens: Charles Gabriel from Charles’ Pan-Fried Chicken comes down from Harlem and serves up some of his famous fried chicken, sides, and banana pudding. The menu is a $25 prix fixe, which is great for midtown, and includes 3 pieces of fried chicken, cornbread, two sides, and banana pudding. It is a little irritating to know that for a mere $13, you could get it buffet-style, but the place is just so difficult to get to. And Patroon had live jazz, so that was a nice touch (for those of you who are curious, simple two man operation: piano and upright bass). Anyway, after sipping away on a 2003 Sylvaner and an order of good-enough riblets, the masterpiece arrived in front of me. Three ample pieces of chicken, collard greens, and mac and cheese were all it took to send my stomach into a happy place. The chicken was cooked perfectly, with a light and delicate crust that can only be achieved in shallow pan-frying. I didn’t think I could ever say that I preferred a lighter crust, but this chicken made me a believer. It made me want more with every bite, and all that was left at the end of the meal was a pile of cleaned bones. I went vulture on them bones. The below picture does not do any justice whatsoever. The place is dark. Yesterday was my actual birthday, and I wanted to do a small dinner with some of my closest friends here in NYC. I kept it small and avoided the crowds and hassle of picking a bar and all that. BG and I figured that Pulino’s would be a fantastic place to have a casual meal with some great food and good ambiance. The only issue was the fact that they could only accommodate us at 6pm. But hey, I’m 29 now, so I looked forward to the chance to get to bed by 9pm, even on my birthday. We decided to make an afternoon of it and head over to Loreley for a few beers lagers before dinner. Even though the bar was pretty crowded, we snagged a table and put back a few steins of beer, with a de rigueur order of pretzels. The pretzels there are fantastic, by the way. They are light and fluffy, with a great crust and the perfect amount of salt (“these pretzels are making me thirsty!”). At six, we meandered over to Pulino’s, expecting a moderate crowd, but nothing crazy. Believe me when I say the place was PACKED. But, our table was set up and ready to go, as promised. From the second we got there, I must say that the service was phenomenal. Everyone was friendly and helpful without being overbearing. Really a great dining experience. 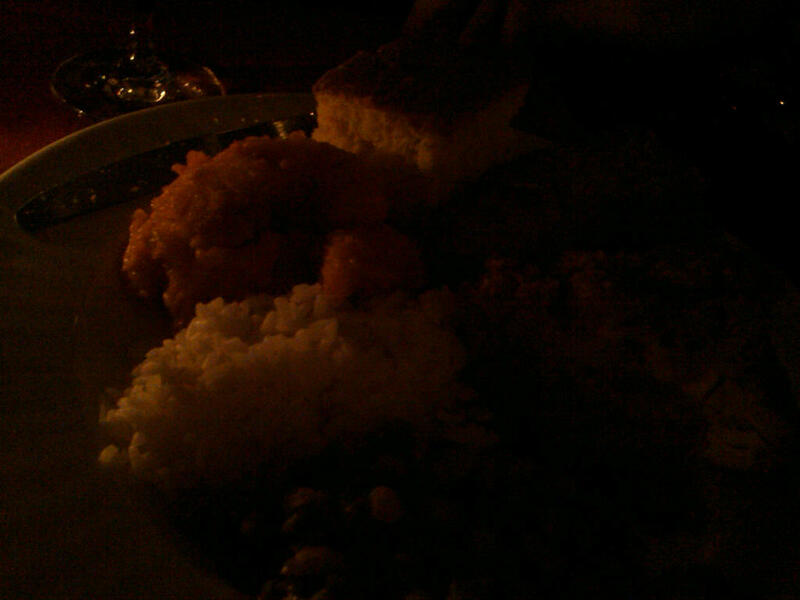 But more importantly, the food was just awesome. We started out with some prosciutto San Daniele, which was really good but a modest portion for the price. 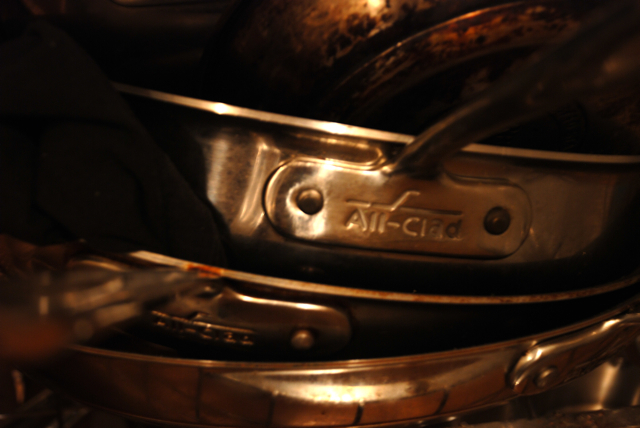 With them we had some cicciolli frolli, which were out of this world. Fried porky goodness with a mustard vinaigrette. Heavenly. The manager told us that he has limited his intake to two per week– I could eat two per hour, every hour, including sleeping time (having these things put in front of my face would be a far better wake-up call than the mechanical bell that I want to crush with my fist every morning). After the meat amuse-bouches, we had some salads: red cabbage and roasted sunchokes (pretty good, needed more sunchoke), chicory and something else (light and refreshing but clearly not super memorable), and the roasted asparagus with ham (I think). The salads were a crowd pleaser, and they provided a nice intermezzo before the main event: PIZZA! Every bite of pizza I had was the best pizza I have had in a long time. I say this cautiously, but this may be my new favorite pizza in the city, usurping the spot that was recently achieved by Motorino. A few disclaimers: I don’t like New York style pizza all that much. I would much rather have a neapolitan style pie with dough soup in the middle than a New York slice (Di Fara is probably the only exception). I really like crispier crusts, so Roman style pizza is totally my cup of tea. And every pie delivered. The margarita was smokey and cheesy and rich, with a perfect crust. The polpettini pie was great (BG’s fave), with a light pesto and flavorful meatballs. I actually only had one slice of the mushroom pie, but it was tasty. The porchetta pie was my favorite, by far. The porchetta was smoky and salty, like little slices of heaven on a pizza. 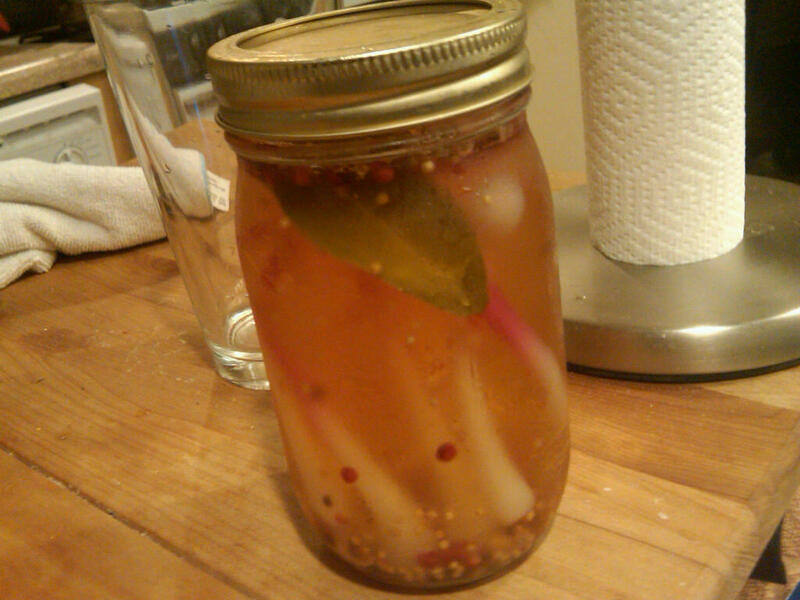 I want some, now. After the pizzas, we had a few orders of the “bowery sausage,” which was an italian-style sausage with peppers. And it was delicious. Then dessert came. Budino, budino, budino. Just get the budino. Case closed. 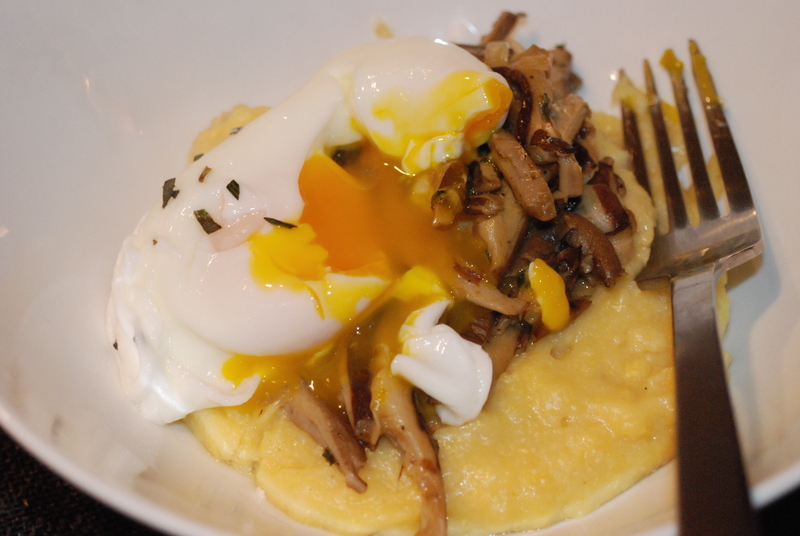 There was the polenta with wild mushrooms, ramps, and poached egg, all sourced from the Union Square farmer’s market. Burgergal did this one up like a champ, with perfectly poached eggs spilling into a delicious blend of oyster, shiitake, and cremini mushrooms. 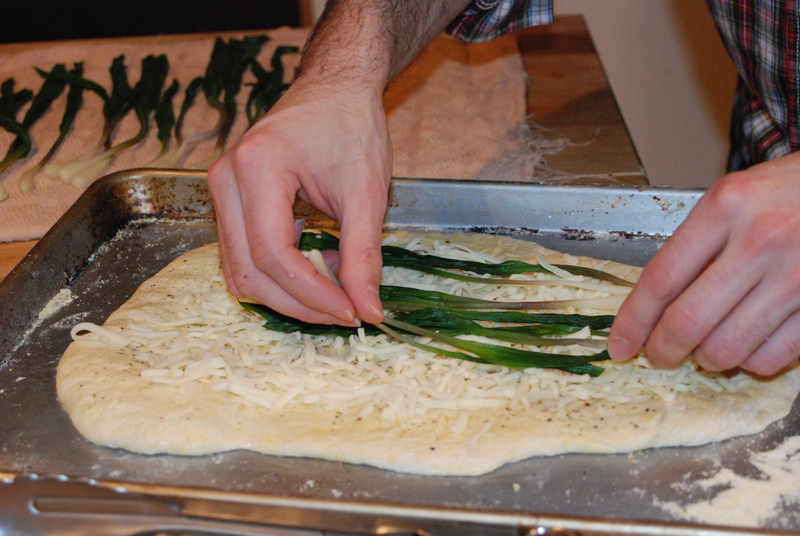 Then there was the ramp pizza, made from scratch. It had been a while since I had made pizza from scratch, but the challenge was worth it. 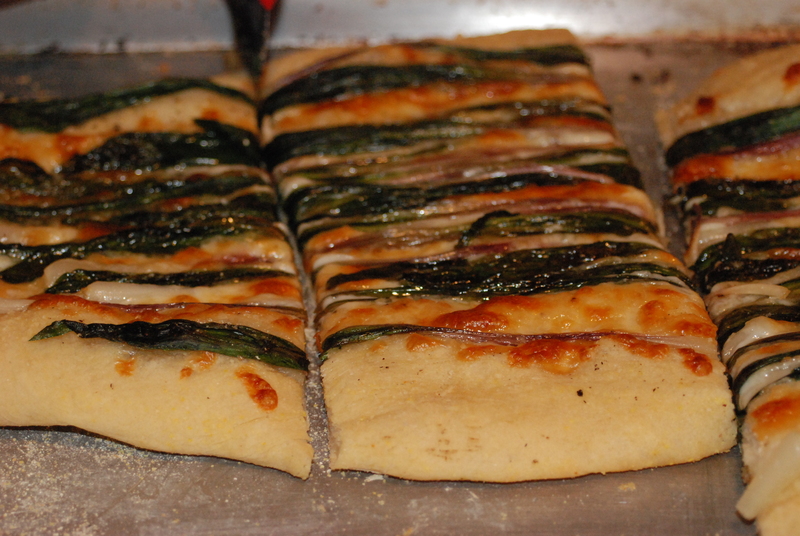 The ramps shined, complemented by a nice layer of parmesan and mozzarella cheeses. The dough was a little too fluffy (contrary to the last time), but it was still really good. 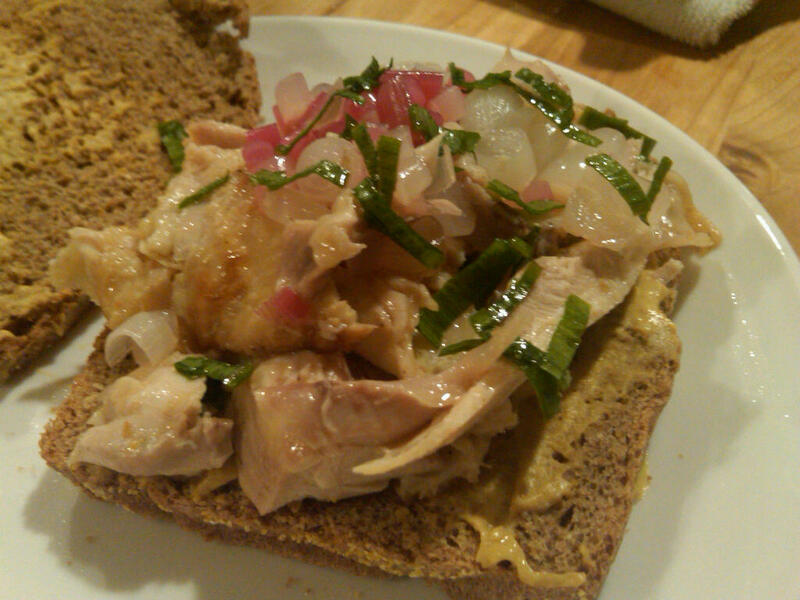 I’ve also been been chowin down on some pickled ramps, in spite of my fear of botulism, on things such as roast chicken sandwiches on whole wheat. I’d also like to give a shout out to Ronnybrook Toasted Hazelnut ice cream. Holla. And lastly, I’ve been buying a lot of wine from Winery Insider. It’s got some great deals, although Cameron Hughes’ site, which was featured in this weekend’s Wall Street Journal, looks pretty intriguing. I mean, what’s in a label, anyway? I’ll pay $20 for a Screaming Eagle.